As opposed to their traditional counterparts, electric woks do not need a stovetop to serve as a heat source. Instead, modern woks are equipped with in-built electric burners. In this regard, you only need to plug your wok to an electrical outlet and you are ready to prepare any stir-fry Asian cuisine. 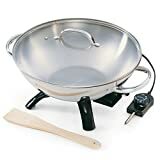 This being the case, most electric wok products are compact and portable; hence easier to use almost anywhere in your home or when you are out camping. However, choosing the best electric wok for any application is not that easy. Not only are there many makes and models to choose from, the various features and capabilities can be a bit confusing, so you’ll want to know how to use one. As you will learn later in this guide, you need to consider such aspects as the capacity, material, safety and adjustability of the unit. Even with such considerations in mind, you will still have many electric woks to choose from. Regardless of the intended application, here are reviews of five of the best electric woks available today. When it comes to robust construction and enhanced ease of use, few brands can beat the Presto 5900 Stainless Steel Electric Wok. 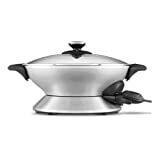 To being with, the product features a stainless steel construction. This gives it the strength and toughness you need for enhanced durability. This, coupled with its superior performance, is why so many people love this product today. The 17-inch diameter wok is equipped with a high-performance, 1500 watts electric heating element. With such capabilities, this unit has been proven to reach a maximum temperature of 350 degrees Fahrenheit. Under normal circumstances, you should not have any problem maintaining a heat level of 300 to 350 degrees Fahrenheit with this product. While some people may view the lack of a non-stick coating on this product as a downside, it may actually make things easier for you. Without this coating, you will find it easier to season the bowl on your own using oil, prior to cooking. In such a case, you will not need to worry about scratching the delicate non-stick coating while at it. Many of the users of this electric wok love the clear lid it comes with. With such a lid, you can clearly view the food as it cooks. The product is also comes with a long wooden spatula. This spatula makes it easier and convenient to stir food in your wok as it cooks. One of the things you will definitely love about this product is its unique construction. In this regard, the product features a stainless steel base and a die-cast bowl. Like many of the best electric woks today, this product is equipped with a 1500-watt heating element. However, the wok fitted with several heat settings to maximize its heat soaring potential. The aluminum layers of the bowl not only allow the extraordinarily high temperature to sear the food; they also help seal moisture in. you will also love the Quantanium non-stick layering used on this product. This coating prevents food from sticking at the bottom of the wok. This, in turn, makes the product easier to clean. The transparent glass lid on the bowl allows you a clear view of the food as it cooks. The product is also equipped with a removable temperature control probe. This makes it easier for you to effectively regulate temperature while cooking. 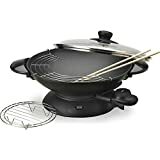 Like the other electric woks reviewed above, the Aroma Housewares AEW-306 5-Quart electric wok uses a 1500-watt healing coil. However, this product is relatively affordable and is packed with a range of superior features. For instance, the wok is fitted with an accessible adjustable temperature control and features a premium non stick interior. Cleaning this product has been proven to be pretty easy. Although it is rated dishwasher safe, you first need to remove the temperature control before using a dishwasher. The adjustable temperature settings make the product rather versatile. In this regard, you may use the high temperature setting for super quick stir fries or just stick to the lower warm heat setting for serving. This may not be the cheapest product in this guide, but it has a set of unique and desirable characteristics to offer. To begin with, you will find the 1500-watt heating element substantial for an array of cooking requirements. Furthermore, the product features a nonstick coating and is safe for indoor and outdoor use. You will never experience any difficulties cleaning the wok either. In this regard, it is dishwasher safe and may be immersed in water while cleaning. The product is made of high quality iron material for enhanced durability and even heat distribution. The Starfrit Multi-Pot wok is a quality, spacious product fitted with a high vaulted lid. You will also love the rapid heating system used on this product. This heating system has been proven to deliver a consistent heating experience to make cooking fun for you. This is further coupled with a full-range temperature control. This makes it easier to regulate heat to suit different cooking requirements. The product comes with the accessories you will need, including a steam bracket, cooking chopsticks and a tempura holder. Like the other leading brands, the manufacture uses a sturdy non-stick coating on this wok. To set the product apart from its competitors, the manufacturer backs it with a reliable warranty. In China, Woks have been in use for more than 2,000 years now. Initially, these units were primarily used for stir frying. As opposed to the traditional woks, modern units feature an in-built electric burner. This makes them more versatile in preparing an array of Asian dishes. 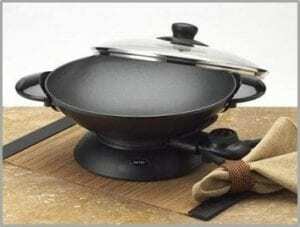 As compared to the traditional stovetop woks, modern electric woks are also compact in design and easier to use. Many users also love the fact that these products are relatively portable. As such, you will find them easier to use almost anywhere, ranging from the dining table, to the kitchen island or even on a campsite. While these products have several benefits to offer, choosing the right one for your needs can be a daunting task. Just as is the case with many other kitchen appliances today, quality is a key consideration when choosing the best wok for whichever application. Therefore, you should only invest in woks that are made of high quality materials. 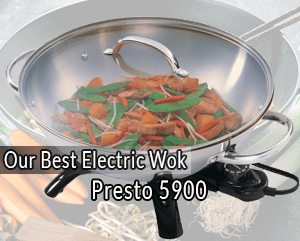 Most of the electric wok models available today are made of aluminum or stainless steel. The truth is that each of the products has its unique set of benefits and downsides. As such, you need to be very careful when choosing the right electric wok material. In addition to being durable, it is advisable to go for materials that have a non-stick surface. Such materials make it easier to clean after cooking. As such, the right wok should have a non-stick interior surface. As for the exterior surface, you can go for what works with your kitchen décor or whatever finish you prefer. Again, the type of material used to make the wok will also determine its cost. Different Asian cuisines require different temperatures to prepare. To ensure that you have bought a really versatile unit that is capable of preparing more recipes, adjustability should be a main consideration. One of the main aspects you need to check, in this regard, is the heat settings on your preferred electric wok. Some of these products may not be able to reach the same optimal temperature as traditional woks. However, a good number of them can easily maintain a temperature of 400 degrees Fahrenheit. This should be enough to prepare almost all Asian cuisines. In addition to a high temperature setting, you also need to check how easy it is for you to adjust the heat settings. The right model should give you enhanced control over several aspects of cooking, including the heat level. The best electric woks available today come in a wide range of sizes. 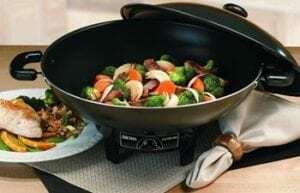 If you are shopping for a wok to use at home, you should check its capacity against your family size. The right appliance should be large enough to feed the entire family. 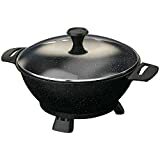 Before you decide on the right wok for your intended application, you first need to ascertain the number of people you will be preparing food for. Again, some people are tempted to go for the largest capacity they can get. Before you do this, you should ensure that you have enough storage space for the unit on the countertops. If you have limited storage space in your kitchen, you should choose the wok capacity and size accordingly. As you may be aware, various electric appliances are required to meet certain pre-set standards. Not only are woks electrical appliances, they also produce a considerable amount of heat. As such, you need to ensure that your preferred product is safe for you and the entire family. To begin with, you need to ensure that you only buy from the reputable brands in the industry. Additionally, the electrical components used in your preferred electrical wok should be of the best quality. Basically, you should only go for the products that meet industry standards. Additionally, it is advisable to choose electric woks that offer additional safety features. Electric woks are some of the common kitchen appliances whose popularity has been on the rise in recent months. If you love stir-fry Asian recipes, the right wok will allow you prepare them at the comfort of your home. The compact construction and portable nature of these products also make them ideal for camping applications. However, shopping for the right product may not be as easy as it may first sound. As you have learned throughout this guide, you need to consider several aspects before making this choice. Regardless of the intended application, this guide will help you choose the best electric wok.